OFFUTT AIR FORCE BASE, Neb. 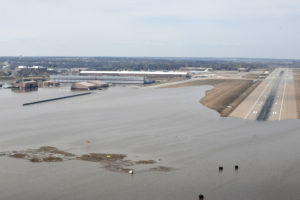 — The Missouri River floodwater surging on to the air base housing the U.S. military’s Strategic Command overwhelmed round-the-clock sandbagging by airmen and others. They had to scramble to save sensitive equipment, munitions and dozens of aircraft. Touring Offutt, the base fire chief, Dave Eblin, kicked one of the soggy corn cobs strewn throughout the base. Asked whether there had been some type of fodder silo that ruptured nearby, Eblin just laughed.